Thanks to Natasha Barr for alot of the info in this post. This is the easiest step and I’m sure you’ve done it a thousand times before. Sign up for Google Analytics and drop your code into your themes footer.php. In my case I called my account and property MyNetwork to match my blog networks name. 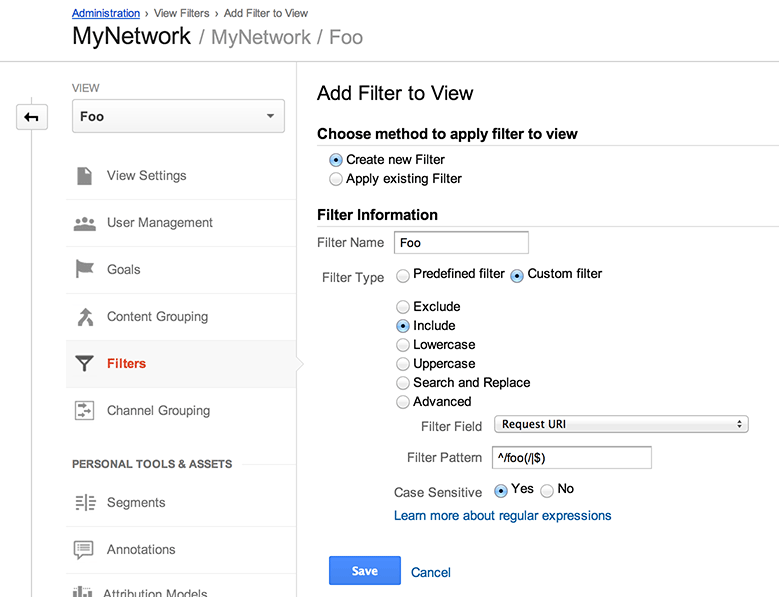 You should already have a MyNetwork property created with your account which will be racking up page views for your entire WP network. Now create a new one per blog by going to Admin – MyNetwork Account – MyNetwork Property – Create new view. For example I created a Foo and a Bar view. Don’t forget to create one for your main blog! Above I’m using the regular expression ^/foo(/|$) to say ‘/foo or beginning with /foo/’ so both the /foo homepage and any /foo/category etc URLs will be caught. Do this for each of your views except the main blog. It will need to be a little different. This makes things a little tricky. Unlike the other blogs, we can’t just add a /blog prefix filter as that would ignore pages and the homepage. Instead you’ll want the regex ^/(blog|my-page|another-page|$)/?. This means ‘Site homepage or begins with /blog or begins with /my-page or begins with /another-page’. GA won’t populate new views using existing data. If you create or change a filter, real time will still list pages that don’t apply to that filter until every visitor has left the page. It won’t immediately update the real time page hits as soon as you save your filter. As always with Google Analytics, you’ll need to wait 24 hours to start seeing values popping up.